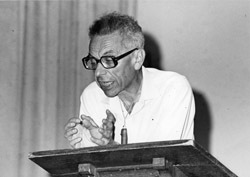 Description: Paul Erdös, mathematician, speaking at either Bethel College or McPherson College. He spoke twice at McPherson College on Sept. 25, 1974, and at convocation at Bethel College on Sept. 26, 1974. His Bethel topic was "Why I Am a Mathematician." 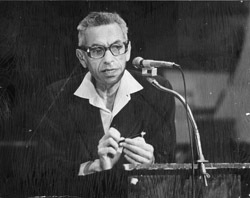 Description: Paul Erdös, mathematician, speaking at either Bethel College or McPherson College. He spoke twice at McPherson College on Sept. 25, 1974, and at convocation at Bethel College on Sept. 26, 1974. His Bethel topic was "Why I Am a Mathematician." This photo was used in the 1975 Bethel Thresher, p. 18.